Readers of Frost Bell who practice Taijiquan are probably familiar with some of the many translations of the 'Taiji Classics' which have been done over the years. These five short poetical texts written during the Ming and Ching Dynasties are considered essential distillations of the art. Teachers use these texts as a guide for measuring the slowly unfolding fruition of Taijiquan practice. Finally a translation has been done by someone who has a really good grasp of classical Chinese and many years of Taijiquan practice. With modesty and clarity Louis Swain explains all the key terms, uniformly using the pinyin system of transliteration and including the original Chinese texts along side the translations for easy reference. Taijiquan instructors will be more than pleased with the depth and precision with which he discusses not only the terms but also the difficult phrases in the texts. He leaves meanings open ended when he feels that they are meant to be read that way in the original, and he makes the point that there isn't much in the language of the classics which is overtly martial in content. He also thoroughly reviews most of the previous translations which have been done. The "Translators Introduction" is eloquent and helpful. It explores some of the difficulties in translating Chinese anatomical and physiological concepts for which there are no equivalent English terms. It also includes a remarkable elucidation the notoriously enigmatic terms song and jin. Swaim makes use of his wider studies to point out poetic references to different Chinese traditions with in the texts. This is immensely helpful for those practitioners who would like to distinguish between Daoist ideas of macrobiotic practice and Neo-Confucian ideas of discipline. The five 'Taijiquan Classics' are actually included as an appendix and the main section of the book is a translation of a book by Fu Zhongwen, a senior student of the famous Taijiquan master Yang Chengfu. 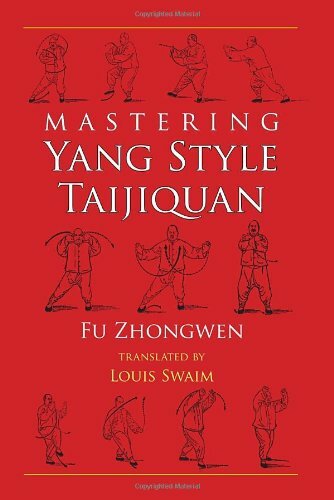 People who practice Yang's style of Taijiquan will find the minute details of his entire 'form' written out clearly with helpful commentary and drawings. Even if you practice another style, don't hesitate to get this book. Louis Swaim's introduction, final essay and translation of the classics alone are well worth the price ($16.95 paper).